Photo source: Vanina W. Some rights reserved. 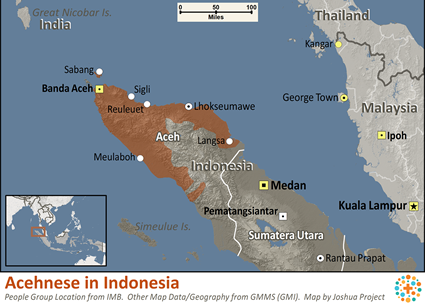 The Aceh people live on the northern tip of the island of Sumatra in Aceh province. Their provincial capital of Banda Aceh used to be a stopover for Southeast Asian Muslims traveling by ship to Mecca. For this reason the city is sometimes known as "The Veranda of Mecca". The Aceh people, also known as the Akhir, A-Tsing and Urueng, are the majority ethnic group in Aceh. Known throughout Indonesia as devout followers of Islam, they are very proud of their Muslim faith. Their lives are strongly influenced by Islamic law and Aceh province even has special autonomy to apply Islamic law instead of Indonesian national law in certain cases. The Aceh speak their own language and most also speak the Indonesian national language. The Aceh are a blend of many races, which might explain why the Aceh in some areas are taller than most Indonesians. The Aceh are a majority in the regencies of Aceh Besar, Pidie, North Aceh and West Aceh; they are a minority in Central and South Aceh. Most Aceh are either farmers or fishermen. Traditional homes in Aceh consist of a sleeping room and a large living room, which may also serve as the kitchen containing a rectangular clay hearth filled with ashes. These houses generally stand on stilts two meters high. Families use the space beneath the house to keep cows, sheep, goats and chickens, or to store tools and firewood. The floor and walls are made of bamboo or wood from coconut trees. Roofs are covered with clay tiles or thatch made of palm leaves. Most new homes built today, however, are from cement block and mortar. Traditionally, both men and women in Aceh wore a sarong, a modest and colorful skirt. However, in recent years there has been a move toward Islamic dress. The traditional Aceh weapon is the rencong, an ornate sword. Men wear it folded into the sarong as one of the accessories to their ceremonial dress. Women typically run the households, while men tend to stay out of domestic affairs, including child rearing. All children, even the youngest, are expected to help with the family work. Inheritance is settled according to Islamic law with men receiving a double portion, yet houses and land are always passed down to the women. The Aceh people are strict Sunni Muslims and have been very instrumental in spreading Islam throughout Indonesia and other Southeast Asian countries. It is often stated that "to be Aceh is to be Muslim." The Aceh people have strongly and even violently opposed other Aceh people who converted to other religions. Because Aceh was the first province in Indonesia where Shari'a Islamic law was formally instituted, other strongly Islamic provinces are also seeking to implement Shari'a law. The law requires all women, even non-Muslims, to wear head coverings. Other ethnic groups living in Aceh province, however, may worship according to their own religion. Orthodox Islam for many Aceh people is combined with animistic beliefs in spirits and various superstitions. These beliefs center on seeking protection through magic by either appeasing or controlling both good and bad spirits. In December 2004, Aceh was hit by a tsunami that destroyed many areas and took 120,000 lives. All the affected areas, including Banda Aceh and Meulaboh, are majority Aceh areas. Several non-government organizations continue helping Aceh's recovery, but most have now left, yet Aceh still needs reconstruction and rehabilitation. View Acehnese in all countries. Location in Country: North tip of Sumatra, both coasts, Aceh Province, Aceh Besar, Aceh Jaya, Aceh Barat, Nagan Raya, Aceh Barat Daya, Aceh Selatan, Aceh Sinkil, Aceh Tamiang, Kota Langsa, Aceh Timr, Aceh Utara, Kota Lhokseumawe, Bireuen, Pidie Jaya, and Pidie regencies; Weh and neighboring islands off north tip; into Sumatera Utara Province, Tapanuli Tengah regency, south coast enclave.